This is a condensed list. I tried not to list some of the crazier diets I tried like the Grapefruit Diet or the Vegetable-Soup-for-Three-Days-Diet. I tried the Slim Fast Shake diet, but I was doomed from the outset because you don’t really chew on that diet, and I like to chew. Recently, my acupuncturist convinced me to eat vegan three days a week. I said I could do that. I could eat a plant-based only diet three days a week. The only problem with that was dairy. Vegans don’t eat real butter. They don’t eat yogurt. They don’t eat eggs, and they don’t drink milk. Why? Because those are products of animals. I had a hard time with butter and yogurt, especially yogurt because I take my medicine with yogurt in the evening. Eventually, I found substitutions, like applesauce, and changed some patterns. Oh yeah, I also was in the process of giving up sugar—evil, evil sugar. That was hard. I thought I would have to go to rehab or put myself in a coma just to get through the hump of craving this fine white powder. Day one I had resolve and kidded myself into thinking this wasn’t going to be so bad. On day two, I had the shakes and sweats. On day three, I asked, “Why is this substance legalized in the United States?” On day four, I was looking at pictures of ice cream sundaes on the Internet and was sobbing in my bed. Eventually, the sugar addiction got better. This went on for several months. I got good at the vegan thing. I made a big bowl of quinoa salad every week, and ate off that. I sliced and diced my veggies, and ate fruit for snacks. I even got into nuts, something I never liked before. And, with little angst and drama (other than the sugar withdrawal), I lost 16 pounds. All was going well, and then my low sugar veganism came to a screeching halt. I was thwarted by a common threat—THE VACATION! 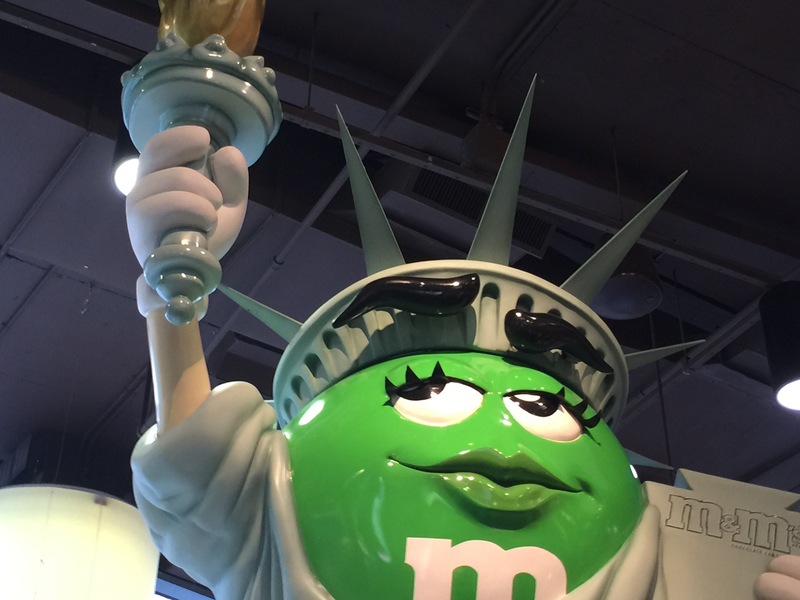 The first day, I was able to eat like a vegan, and day-two wasn’t so bad other than the cheese on the New York pizza, but when we walked into the M & M store in Times Square I was a’gonner. I had no resolve. I wanted chocolate, and I wanted it now, and I wanted it in bulk! So much for no sugar or vegan! After that, it was a feeding free fall. Meat lasagna? Why not? Fish and Chips? Fish can’t be that bad for you. Cheeseburger and fries? Call Jimmy Buffet because I was in paradise. This what-the-hell-eat-whatever-you-want attitude has now lasted weeks beyond my vacation. I do not know what it wrong with me. Why do I continue to buy ice cream bars and hide them from my children? Why can’t I resist my own beef stroganoff and grilled chicken that I make for the rest of the family? Why can’t I get back in the pool and swim some laps—even one lap would impress my ego right now. These questions are not rhetorical. I need answers. I need an intervention. I need something to get me back on track before I turn into the Stay Puff Marshmallow Man. Can someone, anyone, help? hopes this helps a little, hang in there and thanks for posting!